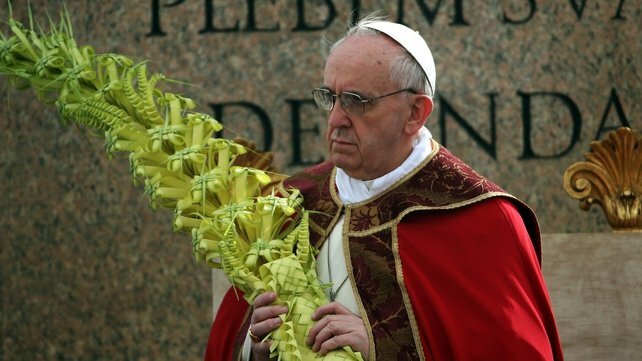 Today, as per the custom for Palm Sunday in Rome, the youth of Rome gathered to hear Pope Francis. In both his homily and Angelus address the Pope spoke of Mary. Many saints of the tradition have regarded Mary as a teacher. In fact our most recent popes referred to a specific “school of Mary.” Mary teaches us about her son and she is a guide for us as we strive to live more faithful lives. By her example she teaches. Today Pope Francis tells us that Mary specifically teaches us the joy of meeting Christ. Dear Brothers and Sisters, At the end of this celebration, we invoke the intercession of the Virgin Mary, that she may accompany us during Holy Week. May she, who followed her Son with faith all the way to Calvary, help us to walk behind him, carrying his Cross with serenity and love, so as to attain the joy of Easter. May Our Lady of Sorrows support especially those who are experiencing difficult situations. My thoughts turn to the people afflicted with tuberculosis, as today is the World Day against this disease. To Mary I entrust especially you, dear young people, and your path towards Rio de Janeiro: This July, Rio! Prepare your hearts spiritually. May all of you have a good journey! Given the nature of today’s liturgical celebration, Pope Francis rightly focuses on the sorrows Mary endured on the way to Calvary. Catholics throughout the holy season of Lent have gathered at their local churches or on their own to pray the stations of the cross. Many people who pray the stations often sing verses of the Stabat Mater after each station. The Stabat Mater has been used as the Sequence for the feast of Our Lady of Sorrows. While the verses do not relate to each station, it incorporates an element of Marian piety within the Stations of the Cross, thereby allowing an individual to make the Way of the Cross with Christ and journey with His mother to Calvary. In the Angelus, Pope Francis invoked Mary’s intercession to accompany us, that is the Church, throughout Holy Week. He cites the example of Mary who journey with Christ along the way of the Cross. As Mary walked with Christ, by her example then we too should carry our crosses with him. He then invoked the intercession of Our Lady of Sorrows for those who suffer. In so doing he implicitly invited them to unite their sufferings to Christ and to share their burden with Mary. Finally he entrusted the young people to Mary’s intercession as they prepare for World Youth Day in Rio de Janeiro. Notice the way in which Pope Francis called upon Mary. He first invoked her intercession that she may accompany. Then he called upon her support for those suffering. And then he entrusted to her intercession other people. Invoke, accompany, support, and entrust. In reading many of Pope Francis’ other writings these are constant themes that he addressed in terms of Mary and in general the call to discipleship. Expect to see this become a theme of his Mariological thought throughout his papacy.